Hospital clinics, offices, temporary sleeping quarters, retail fronts- what do all of these have in common? Each can be built within the confines of a standard ISO shipping container. It began with the history of globalization and it is called-containerization. It’s origin can be traced back to increasing the efficiency and movement of goods –worldwide. With the economic turndown starting in 2010, unused shipping containers were left abandoned in freight yards and lots. How can these globalization leaders be given a second life? Examples are endless, mind boggling and architecturally innovative. Let’s take a recent development by Starbucks in their use of a shipping container in the development of a store built with LEED standards. The shipping container became the key standard by filling the role of recycled content and material. A Massachusetts based non-profit, Containers2Clinics provides pre-fabricated, fully outfitted clinics to remote areas and points of natural disaster. Each clinic is produced in it’s entirety inside of a standard ISO shipping container. While major international coffee producers and ground breaking non-profits have capitalized on the use of these globalization leaders, how can these repurposed shipping containers help our local business or personal storage and habitat needs? Take a standard 20’ ISO shipping container and add a door, window and electrical and you have you created a mobile office. These basic container modifications take a steel shipping container and help create mobile work or living space. Add furniture and even air conditioning and your temporary secure and weather resistant mobile work or living space is ready for your next project. You need temporary sleeping quarters for work staff that needs to be mobile? 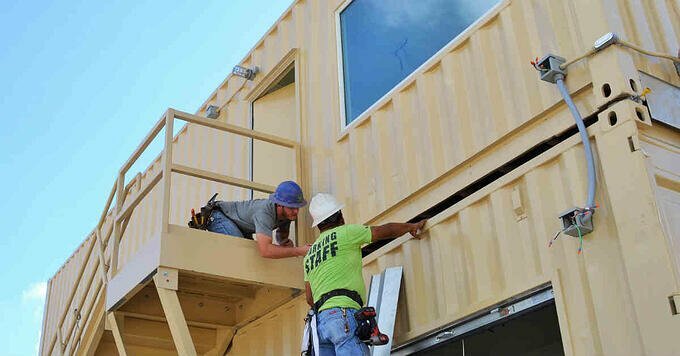 The use of an ISO shipping container leads the way in reusing material, while providing safe temperature controlled living space for your staff. The ideas are endless and the uses of these historical legends run rampant. Consider taking a look at the use of a repurposed shipping container for your next storage or temporary and even permanent living needs. Portable storage containers can help save the planet, save you money and be part of a revitalization movement.